Malware and Viruses - what are they? Many are confused with the terms malware and viruses. Both are types of software that are harmful to the computer. But knowing the difference between the two gives us better understanding of what is computer malware and viruses. To put it simply, a virus is a type of malware that is capable of self-replicating once it enters the computer. Malware is a broader term where Virus, Trojan, Adware, Spyware, Ransomware, and other types of malicious software fall under. Each malware operates differently. It is created to perform a specific function. In general, all types of malware are harmful to the computer. To understand malware better, let’s discuss the different types of malware. A virus is a type malware that can self-replicate through an executable file. Once the user runs the file it attaches itself to, the virus starts spreading throughout the computer. Then it can overwrite the data which destroys important files and legitimate applications. A virus is spread through a spam or a phishing email. Note that a virus cannot spread until the user runs the infected software. A worm is another self-replicating malware. The difference between worm and virus is that worm spreads independently on the computer without the help of an executable file. Once it enters the computer, it spreads fast, then travels within the network, and infects the other host computers. Once worm overloads the network, it may result in network interruption. A ransomware is expert at encrypting files. Once installed, it loads in the computer memory and it deletes itself. That doesn’t mean that it no longer exists, it’s very much active. It does that to remain undetected so that it can access the hard drive files covertly. What’s more alarming is that Ransomware targets specific files such as PDF, Word, or videos that are valuable to the computer so that paying the ransom is guaranteed. Note that once the files have been encrypted, they cannot be restored without the decryption key that the hacker holds. A trojan deceives its victim into installing it by pretending to be a genuine file. Often, the user has no idea that it is a malicious file because it looks like a normal software. It can pretend to be a fake installer or update. 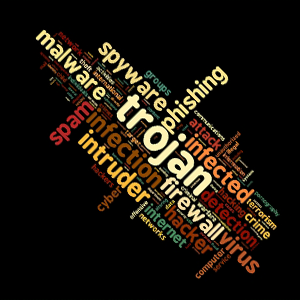 Once installed, Trojan is known for installing more malware. Then the other types of malware give the hacker control on the computer without being exposed. Spyware lies between the web browser and web server that gives it access to all kinds of information that user searches on the Internet. Therefore it can be used to record Internet calls and messages. What’s worse is can also record account details such as username and password. The hacker then can use the information to empty the user’s bank account. BOTS are virtual robots that target computers with a poor antivirus. Once the computer is infected with BOTS, it becomes a part of the collection of zombie computers. Once installed, BOTS wait for a specific command coming from the central server that a hacker controls. BOTS can transmit bank account information to the hacker’s end, which can be used to transfer money. Now that we have a clearer idea of what is computer malware and viruses, how do we know if we have malware in the computer? Windows only displays unusual error when there’s a bug in the computer or critical data is infected. If an unusual error keeps reappearing on the computer, it could be a sign of malware infection. Run a malware scan immediately before malware does further damage on the computer. Malware scan will detect threats hiding in the computer. We have mentioned that malware consumes the computer memory that results in low disk space. If the computer is running out of space, Windows usually displays a balloon notification at the bottom of the screen. It’s better to check what consumes the computer memory. If there’s a suspicious file, uninstall it; it could be malware. Reduced computer speed is sure sign of malware. Because malware consumes space and destroys computer data, it definitely results in the slow computer. The computer programs need enough space to run properly. In addition, once malware has destroyed the computer data, the applications start crashing. Do you think that your computer is infected with malware? There are ways to remove them. Click here to learn about malware removal and prevention techniques.